Hooray! Time For World Naked Gardening Day! Lately I have heard a lot about the rising cost of produce. Every week there is a story in the news about the drought in California, increased transportation costs, supply and demand issues, etc. At the same time I see bigger, brighter, fancier and over stocked giant grocery stores being built a car drive away from the consumer. I’m sure you pay for these fancy grocery stores too! Then I look out my window and think that in a few weeks, I will be picking fresh salad greens, herbs, beans, peas, beets, carrots, turnips, potatoes, onions and strawberries all within a fresh morning walk and basically free. Through the off-season, canned and frozen fruit and vegetables that came from the garden, again for free! Saving money. just another good reason to start a vegetable garden this summer if you have not done so already. Also a good reason to plan an expansion this year, maybe another raised bed or a few straw bales to increase production. Even a small plot will start you on the path of savings. The following article is from the Gardening Channel and covers some financial advantages of growing your own garden full of fresh vegetables. It also goes into the “best bang for your buck” on which vegetables to grow to save the most. Saving Money with Your Vegetable Garden: How Much You Could Save? Growing your own vegetables is bound to save you money during those all-too-frequent grocery shopping trips. But if you plan strategically, you can maximize the dollar potential of your vegetable garden. And we don’t mean selling your crops, which results in instant profit. Instead, we list some of the best and worst financial choices for your vegetable garden based on $2 seed packet purchases. Of course, what you grow is subject to personal preference; these options are purely based on savings potential. First, let’s take a look at those vegetables that make the least financial sense. Potatoes and onions are so inexpensive at supermarkets that you will not save that much money by growing your own. Also, vegetables like cauliflower and artichokes that are especially susceptible to disease or pest infestation may yield fewer crops, thereby adding to your grocery list. Now for money-saving crops. Bags of spinach, arugula, or Swiss chard can cost as much as $5 per bag in stores. These also do not stay fresh for long, so if you cannot use entire bags at once, you are actually losing money. In order to ensure a continuous supply (not surplus) of fresh greens, plant some seeds each week. These easy-to-grow greens only need about 4-6 hours of sunlight per day and moist soil at least 6 inches deep. How does this add up? If your garden ends up producing 20 weeks’ worth of salad greens and you previously bought 3 bags weekly for $4 each, you just saved $240 by growing your own versatile leafy greens. With pint prices similar to salad greens, you can save lots of cash by producing your own heirloom cherry tomatoes. This variety has a longer growing season and higher yield, which makes financial sense. Make sure your plants have at least 6 hours of sunlight per day. One plant can produce about 20 pints of heirloom cherry tomatoes. How does this add up? If you produce 60 pints of cherry tomatoes per season and avoid spending $5 per pint, you just saved $300 this season. These heavy heirloom crops can cost as much as $6/lb in markets, much more than other green bean varieties, which makes these crops ideal money-savers. Each seed packet you buy can produce pounds of beans. Full sunlight is necessary for these beans. And for maximum savings, opt for beans that grow upright on vines, which will yield additional pounds simply due to available space. How does it add up? Assume ten plants produce three pounds of beans each: your savings comes to $180. Finally, an endless supply of herbs can make a real dent in your grocery bill. You can either spend $3 on a single fresh sprig or buy a four-pack of starter plants. Here’s where the savings really add up: each plant can produce 50 times as much as what you can get for that $3 at the supermarket. Herb plants will need 4-6 hours of sunlight per day. Make sure to clip flower buds for maximum flavor. How does this add up? If your four herb plants each produce 50 sprigs, you just saved $600 this season on herbs. However, this is a lot of herbs! Even if you only use the yield of one crop, your savings equals $150. Freeze the rest using filled ice cube trays to use over winter. Occasionally the Creative Garden Patch re-posts what we consider relevant information curated from other sources. If you like what you read, please consider visiting the source site and checking it out for more useful information and another valuable resource for your successful gardening. Like the Creative Garden Patch on Facebook to get all of our re-posts. The following article by Kristi Waterworth is from Gardening Know How. Gardeners do all they can to keep their plants happy and healthy, but sometimes, no matter what you do, certain plants just don’t go together. Plants that don’t like each other may be responding to different environmental needs, could be in direct competition with one another for major resources or one may attract insects that severely harm the other. Determining plant incompatibility can be a guess and check situation since soil types also have an influence on what plants should not be planted together. There are a few basic rules of thumb when it comes to plants to avoid near one another. First, check that your garden plants are all about the same size and have the same light requirements. Planting very tall plants like tomato  next to bush beans , for example, is a very bad idea since the tomatoes will very likely shade out the beans. When planting taller and shorter plants together, make sure that the shorter plants are spaced far enough away and orientated  so the sun will shine on them during the day. Many gardeners solve this problem by putting the shortest plants in their own row on the edge of the garden or planted as a border planting. Plants that need a lot of water will cause those water haters nearby a great deal of discomfort – the same goes for fertilizer. It’s always a good idea to plant things with similar nutritional and water needs together, unless they’re fiercely competitive. Even then, you can often compensate by spacing them extra wide and providing enough fertilizer and water for both types of plants. Last, but not least, are the plants that are allelopathic . Allelopathic plants have the capability to chemically impede the vital systems of competing plants. These plants are usually weeds, but many landscape and crop plants have been observed leaving behind allelopathic chemicals. Plant scientists are using these observations to develop better methods of weed control for farms and gardens alike. What Plants Should Not Be Planted Together? Black walnuts  have long been known to interfere with garden plants like tomatoes, eggplants  and corn . When planting broccoli in your garden, make sure that you practice good crop rotation  since broccoli can leave behind residue that other cruciferous crops  can’t tolerate. Some plants, like alfalfa , seem to exhibit a remarkable type of allelopathy that interferes with the germination of their own seeds. Garlic  and onions  are believed to interfere with the growth of beans and peas, but seem to be compatible with most other garden denizens. Have any questions about this topic? Visit us at http://questions.gardeningknowhow.com to ask your questions and get friendly answers from gardening experts. Copyright © 2015 Gardening Know How. All rights reserved. We have moved in an organic direction with the vegetable gardens for the past five years. We decided that if we are going to grow vegetables it makes sense to make the effort to produce great tasting, nutritious vegetables free of artificial fertilizers, pesticides, and other chemicals. It was a moving back to the land kind of idealism of growing and processing our own food that made the concept attractive. We heard all the excuses about lower production, insects will prevail, and it is too hard to go organic. Our wish to have healthy great tasting food, however put us to work researching garden methods that would be productive, low maintenance, and incorporate organic production. We decided to start with raised beds. The “upper garden” now has eight raised beds and we have started using Square Foot Gardening. Two years ago the “lower garden” was started. It is a 30’ by 75’ area and is developing as a Raised Row Garden. A section of the lower garden is for experimenting with other techniques. 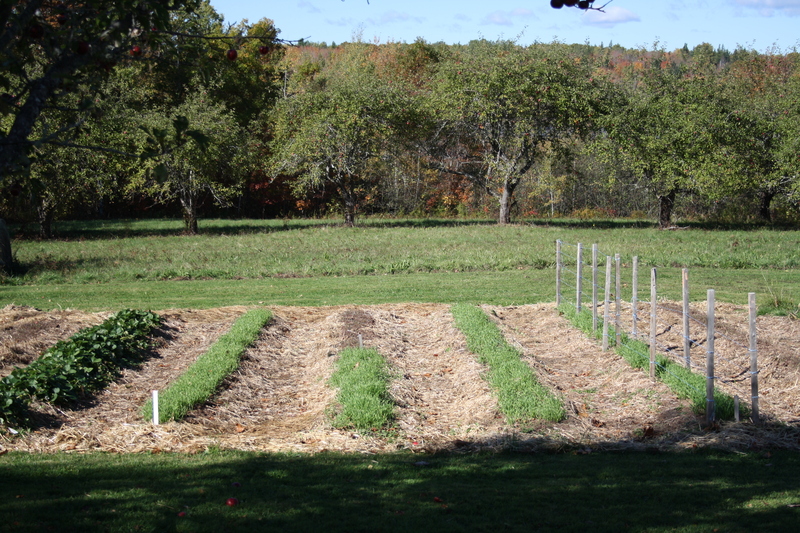 An earlier post describes our summer 2015 experiments including Straw Bale Gardening. Here are some things we feel are important if you are going organic. Today’s posting, Part I of our Learning Curve addresses soil. 1. The structure of Soil is the foundation of organic gardening. It is necessary to know as much as you can about the soil’s texture, pH levels, and the eco-system. Texture relates to the components that make up the soil. The three main components are sand, silt, and clay. The percentage of each in a soil sample will determine the texture of the soil. Soil structure can range from sandy and loose to clay and compacted. Soils high in sand content tend to drain quickly and not hold moisture needed for growth. Soils high in clay content do not drain well and hold too much moisture that can lead to root rot and kill your plants. A “feel” test can help determine your soil texture. Sandy soils will feel gritty and when moist will not clump together. Silt soils feel powdery when dry and will clump loosely when damp. Clay soils will clump tightly when squeezed and will mold together when damp. Healthy soil also has organic matter supplied by decaying plant and animal waste. Healthy soil has that nice earthy aroma that gardeners thrive on. The organic matter is necessary for plant nutrition and feed for the living micro-organisms living in the soil. Everything from microscopic bacteria, fungi and beneficial insects make up the soils eco-system. The soil needs to be alive! Repeated use of commercial fertilizers over the years can “kill” the soil. The soils eco-system is the basis of organic gardening. Time to recall your high school chemistry acids and bases. The pH scale goes from 0 to 14 with 7 as the mean. The pH of the soil is important as it will determine the plant’s ability to use nutrients in the soil. Most vegetables need a pH level around 6.5 in order to uptake the available nutrients in the soil. Home test kits are available at your garden center to test your soil pH. We test each bed and row every year and plant or adjust the pH accordingly. Adding lime to the soil will raise the pH level decreasing acidity. Adding sulphur to the soil will decrease the pH level decreasing the alkalinity. Be sure that the additive you use is approved safe for organic gardening. More on plants and the effects of pH on nutrient uptake and soil pH modification can be found here. Soil structure is so important to the success of the organic garden that we constantly amend the soil. Successful organic gardening means making your own compost, lots of it and adding to the growing areas. It means planting cover crops as “green manure” and most importantly, testing and monitoring your growing beds. Always remember to keep records of your results. The more you improve soil structure the healthier your garden will be. Healthy plants are disease free and less attractive to detrimental insects. The stronger your soil structure the lower the labour needed to enjoy your own nutritious, chemical free fruit and vegetables. We are still learning and have a long way to go yet. Should you wish to dig deeper into soil structure, check out Phil Nauta at the The Smiling Gardener. In the next post, we share our learning and experiences with natural fertilizers and tips to keeping a healthy garden. Still waiting for the snow to go!